Our guest birth story this week is kind of exciting! A friend of mine recently had an unassisted home birth after two c-sections and one hospital vaginal birth. For info on unassisted birth you can click here. Basically, some women choose to birth without an attendant, midwife or doctor so that they can experience birth with just themselves and their family without any outside fear or interventions. January is also an outspoken advocate for vaccine education, intact baby boys, upper cervical Chiropractic, and attachment parenting. She blogs weekly on her husband Brandon's FAMOUS Upper Cervical Chiropractic blog The Atlas of Life and you can read about her entire unassisted pregnancy journey on her personal blog here She is also currently studying to be a Chiropractor, a longtime dream of hers. Everyone has been asking for our birth story. I was so excited that I was going to write it all out and post it right away. Every time I opened up a fresh, “add new post” page, I became frozen. When the baby was a few days old, Brandon and I were watching a movie that was kind of emotional. When it ended I began to cry and some feelings came out (this happens a lot post partum!). I realized that my birth was so special and sacred this time that I can’t just post it, details and all, on a blog for the whole world to read. It was too intimate for that. If you haven’t had a natural childbirth, you may or may not understand. I didn’t before this birth. And I even had a VBA2C last time, but it wasn’t intimate and natural! So, I apologize if this is a let down. I am going to share how the birth went, but the details and beauty of it I am keeping to myself. If I know you and begin talking to you and feel comfortable sharing details with you, then I will, but not like this…on the internet! Here is an overview. It still seems like I am sharing a lot, but there was so much more! My labor was 20 hours long, beginning Tuesday morning at 9 am after nursing my 20 month old. This is very short for me in comparison to my last 2 labors. It was perfect actually. I labored on my own all day. Brandon took care of the kids. I did whatever felt natural. I layed down a lot and rested, ate, went potty, etc. The contractions were about 5 minutes apart all day. I just relaxed like I had practiced with all the prodromal labor I had for weeks previous. I visualized and practiced positive self talk (to myself.) It was amazing to just give over and relax. My labor was NOT painful at all. It could have been. I really learned with this birth that it is mostly mental. It’s not about tolerating pain, it’s about giving over to the process of birth and having no fear! Once all the kids were in bed and asleep (about 9 pm), I layed down with Brandon and we rested. I labored between my bedroom like that and in the kitchen leaning over our high counter. I received a text from my friend Tiana and saw it was around midnight. At this point things were picking up more. She was the only person I told I was in labor. A lot of people called me that day actually. I was on their radar! We didn’t want anyone to know we were in labor. Tiana just text me at the right time, I guess, and I felt better after texting with her. All day I groaned and moaned through my contractions. I was getting a little more vocal and tired in the early hours of the morning. I started to question things. I realized I must be getting close to transition. This is when Brandon’s support really helped. He prayed for me a ton and talked to me and would help center me. This is also when I realizied that I had to COMPLETELY give over so I didn’t stall my labor like the last two times. I finally got in the tub. After Brandon and I prayed and talked, I mentally went into myself. You know how you see or hear of women being SILENT, that was me!!! I just went into the contractions and after a few of these, my water broke in the tub. It was so cool. I got out of the tub and was having a hard time relaxing. I was getting shaky and kinda questioning my sanity! LOL. On the flip side of that though, I also told myself that I was in transition. I knew what was going on. I continued to trust in birth, trust in God and trust myself. I believed in my body and knew everything was OK. The baby was moving all throughout my labor (she was high and working herself into a good position) and I never once felt I would need to transfer. What faith! I got back in the tub and went back into myself. I got silent again. After a while, my feet starting getting numb, so I got on hands and knees and it was INTENSE. I got out of the tub and went potty. All of a sudden the contractions were super intense! I couldn’t continue being silent. I worked really hard to breathe through them, but I was pushing too! I couldn’t believe it because the baby had still been high. Our 20 month old woke up and she and Brandon watched me as I breathed and pushed. There were only 6-7 contractions like this. After about 3, we felt and her head was in the birth canal. After about 2 more she was crowning and in one more contraction she slid out into Brandon’s waiting hands. I birthed her standing in a half squat. It was amazing. The details of this part are so emotional and beautiful. This was just a quick summary. For this blog though, I will share that we were ecstatic and of course in a “we did it!” excitement. She was purple and took a minute to pink up. She was just so quiet. It was extremely peaceful. Our 20 month old was yelling “BABY! BABY! BABY!” and loved it. Brandon announced she was a girl. I birthed the placenta easily and we had to work a bit to get my bleeding down. 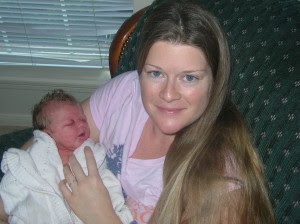 This was the first time my body gave birth with NO INTERFERENCE! I continued to have faith and my body got the hang of it. After getting all cleaned up, Brandon, myself our 20 month old and baby bonded. No one to poke, prod and place fears on us. The older 2 children woke up a few hours after she was born and were so happy we were home. Our oldest cut the cord about 3 hours after the birth (we had promised her she could). Our son was ecstatic because he was right…she was a girl! family and bonding with our new baby has been relaxing. No trauma, no outside interference. Just birth. Thank you for sharing. It was beautiful and made me tear up. A great experience for sure. Reminds me alot of our last baby's birth. Thanks for sharing January and thanks for posting Sarah! So beautiful. Eyes misty. Can't type. Wow. One of my midwives posted your blog on her page (a different post) but I clicked around and wow, this story speaks to me! We're pregnant again. I attempted a home birth last time, labored at home for 41 hours, transferred because she was posterior and asynclitic, and stuck... ended up with a csection. I wish there was more I could have done. Our midwives say there wasn't, but there is always part of me that questions... even though I'm really at peace with the birth in almost all ways. We're going for a homebirth again (there is no other way!). We have found our midwives. This story truly inspires. I believe birth should be woman and baby focused. It saddens me how our society has placed such fear around birth. How so many women don't even think to consider natural birth or to educate themselves and their husbands to become their own advocates. It sickens me that the medical field has aided in building that fear and has corrupted birth so. I think there could be a great place for doctors and hospitals, I'm so eternally grateful for the help I received from the doctor the night I birthed my little girl because intuitively, I knew she was not coming out on our own... but there is a time and place for intervention and it is waaaay over used. I appreciate you sharing stories such as this. What an inspiration! Gets a mama thinkin ;) Make a difference!! wooohooo! I feel the same about my third birth. Anytime I go to share it I just can't it is too intimate, too personal, and so beautiful. It cannot be put into words. I am glad I am not the only one who feels this way. It is the opposite of the intense need to talk and share my hospital birth that I have.